to look for new manuscripts. 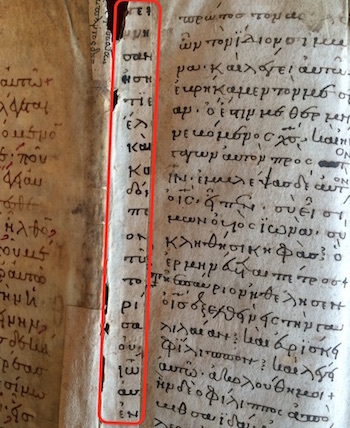 Dan Wallace teases us on his blog with a note that he has recently found more uncatalogued NT manuscripts in Athens. I recently returned from two weeks in Athens, working at the National Library of Greece. My student and former intern, Max Berti, joined me. We discovered a surprising number of New Testament manuscripts. But I’ll have to tell you all about that later. Follow the link to the CSNTM website below, where you’ll see info on several discoveries from 2015. There’s more detail at the CSNTM blog. Rob Marcello tells me that 10 of the new manuscripts have already been published at csntm.org and that more will be coming next month. Before my first trip with CSNTM I remember thinking it was crazy that there could be NT manuscripts just sitting on library shelves that are virtually unknown to NT scholars. Having now seen the size of some of these library collections and understanding that NT scholars are generally busy folks, I now understand better how this can happen. Without doubt, one of the most important manuscripts for our modern editions of the Hebrew Scriptures is the Leningrad Codex B19a, and many institutions own the facsimile edition. [Interesting that people stick with the name ‘Leningrad Codex’ and that the name has not gone the way of the Rhodes statues.] This manuscripts is dated, and to my surprise I learned that from some years later we have a contract with the scribe of the Leningrad Codex, Samuel ben Jacob, to copy ‘Eight Prophets and the Writings’ for the respectable sum of 25 dinars. Read the full story here in the fragment of the month of the Taylor-Schechter Research Unit of the Cambridge University Library. The ink and lettering of the correction stands out as that of one of the later correctors, attractively named Cb2. Colour and style matches the interlinear addition αν a few lines further down (on top of an interlinear correction by an early corrector). But there is something slightly off here, there seems some noise underneath. And indeed, NA27 has this down as Alef1, and so does NA28, which is more reliable when it comes to the corrections of Sinaiticus and, according to Tischendorf himself, "εκεινοι addidit A, item C". Suspicion was justified, εκεινοι of an earlier corrector was overwritten by a later corrector. Look twice, read what others say about it, and look again. In his book Textual Criticism and Editorial Technique (1973), Martin West raises an important issue for the use of text-types in NT textual criticism. When the critic has established that no stemma can be constructed, how is he to proceed? He must, of course, see what groupings are apparent among the manuscripts, and whether the individual groups can be analysed stemmatically… (p. 42). Here we should pause and note that, as Colwell noted in his essay on the genealogical method, this is exactly what Westcott and Hort did in rejecting the “Syrian” text. They applied stemmatic principles, not to individual manuscripts, but to groups. Having done this, they were able to exclude the Syrian text from consideration on the principle that it was purely derivative. We might call this principle eliminatio textuum descriptorum. …even if they [groups] cannot [be analysed stemmatically], he can treat them as units in his further cogitations, provided that they have a sharply defined identity. Thus he reduces his problem to its basic terms. This reduction of the problem is a major reason why text-types have been so valuable in NT textual studies. Where you have four manuscripts in a tradition, you don’t need to reduce the material. But for the NT such reduction is a huge benefit, even a necessity. No one can keep dozens let alone hundreds of manuscript relations in their head and then apply them to specific variations. But three or four relationships is no trouble at all. Hence the value and appeal of text-types. They “reduce” the problem. But note the key qualification in West’s sentence. The critic can treat groups as units in his further cogitations, provided that they have a sharply defined identity. If this is true, then it would seem that the use of text-types in our text critical “cogitations” is in trouble since no such definition exists. Even Eldon Epp in his excellent essay on “textual clusters” says that “the tricky issue, of course, is determining, in percentage terms [West’s ‘sharply defined identity’], what extent of agreement in readings joins members into a group, and what degree of separation in agreements determines the existence of a separate group” (“Textual Clusters: Their Past and Future,” , p. 571). Unfortunately Epp doesn’t have an answer to this “tricky issue” which makes me wonder if our failing effort to define text-types is an indication that we’re trying to solve the wrong problem. Maybe trying to reduce the problem is our problem and we should start looking for ways to use more manuscripts (not less) in studying the history of the text. 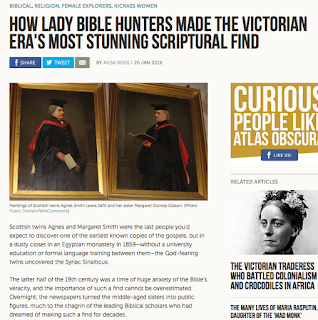 Under labels like “female explorers and kickass women,” Ailsa Ross blogs in Atlas Obscura (20 Jan) about the Scottish twins and biblehunters Agnes and Margaret Smith. Agnes Smith Lewis, In the Shadow of Sinai: A Story of Travel and Research from 1895 to 1897 (Cambridge: Macmillan & Bowes, 1898). Margaret Dunlop Gibson, How the Codex Was Found : A Narrative of Two Visits to Sinai from Mrs Lewis’s Journals, 1892-1893 (Piscataway NJ: Gorgias Press, 2001). Allan Whigham Price, The ladies of Castlebrae (London: Headline, 1987). Janet Soskice, Sisters of Sinai: How Two Lady Adventurers Found the Hidden Gospels (London: Vintage, 2009). Here is a video featuring Soskice who tells the story about the two ladies and her own work on the biography. For earlier posts relating to the sisters and the MSS they discovered, see here, here and here. The ERC project The Hands that Wrote the Bible: Digital Palaeography and Scribal Culture of the Dead Sea Scrolls invites applications for a 4-year PhD position and a 3-year Postdoc position. 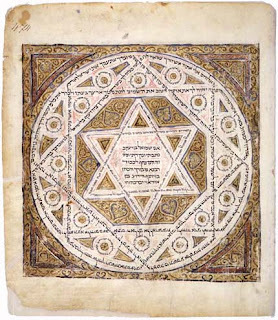 This ERC project is hosted by the Qumran Institute at the Faculty of Theology and Religious Studies of the University of Groningen, the Netherlands. For more information on the two positions, the application procedure and deadline, reference the dedicated web advertisements (PhD) and (Postdoc). The main objective of this interdisciplinary project is to shed new light on ancient Jewish scribal culture and the making of the Bible by investigating two aspects of the scrolls’ palaeography: the typological development of writing styles and writer identification. The combination of new C14 samples and the use of computational intelligence as quantitative methods in order to assess the development of handwriting styles and to identify individual scribes will be used to cluster manuscripts as products of scribal activity in order to profile scribal production and to determine a more precise location in time for their activity, focusing, from literary and cultural-historical perspectives, on the content and genres of the texts that scribes wrote and copied and on the scripts and languages that they used. The goal of the Postdoc subproject is to describe the processes of and developments in three to four centuries of copying the biblical manuscripts found in the Judaean Desert in relation to palaeographic dating and writer identification. The major research question is how variant forms and editions of biblical manuscripts can be correlated to palaeographic dates, to identification of writers, as well as other variables such as scribal practices and different find-sites. Previous scholarship has explained textual variety in terms of chronological developments or sociological differences, or both, based on traditional palaeographical dates, or on models of a Qumran scribal practice, and generally on a smaller sample of manuscripts. 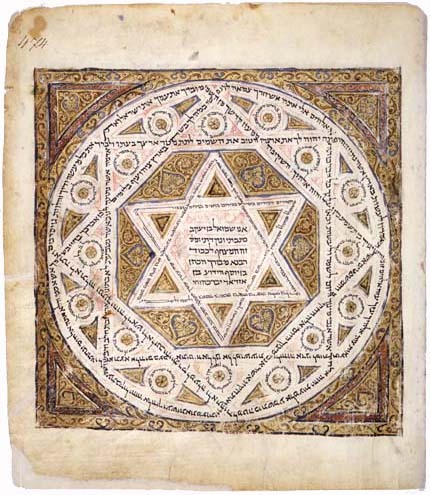 On the basis of a database of all substantial biblical manuscripts from the Judaean Desert, the Postdoc researcher will select one more confined group of manuscripts (most probably either Deuteronomy or the Psalms), and qualitatively analyse the differences between the manuscripts as well as in relation to the authoritative text forms of the later traditions, in order to plot such variants against the developing time and the different find places and correlating these not only to traditional text-typologies of text, but also to occurrences of rewriting and so-called Fortschreibung, and to the various scribal practices. I have had the great honor to work with the research staff of the Kirchliche Hochschule Wuppertal-Bethel for several years now, formerly as a wissentschaftlicher Mitarbeiter, and now as a research associate. In the last month, the institution has secured funding for PhD positions in collaboration with the Bergische Universität Wuppertal. If you are considering doctoral study, I would enthusiastically recommend considering this possibility. Wuppertal has been a center for textual criticism of both the New Testament and the Septuagint in the past years, with funded research projects reconstructing the Greek Book of Revelation (Editio Critica Maior) and the Old Greek Antiochene Text. The present funding opportunities support students integrating digital technology into their research -- for instance the CGBM and the VMR. Interested parties should apply through Prof. Dr. Jochen Johrendt. The deadline (27 Jan 2016) is right around the corner, so don't tarry. The German description can be downloaded, here. The funding is generous (calculated for 2016, here). You will not be driving a Ferrari, but a family could subsist on the stipend (by my calculation 29,527.39 €, after taxes/insurance about 18,423.36 €). German universities regularly receive international students who learn the German language during their residencies. Students are encouraged to write their dissertations in English, if this is their strongest scholarly language. A revised version of the thesis will be published in 2016 (publication date 24 March) by T&T Clark/Bloomsbury in the LNTS series. Significantly, the published version will include high-resolution colour images of all the 24 amulets (except one). The first chapter contains an introduction and survey of scholarship. In the second chapter, Jones discusses terminology and criteria. 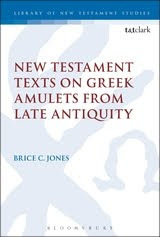 In both of these chapters I note that he has made good use of co-blogger Peter Head’s essay on “Additional Greek Witnesses to the New Testament (Ostraca, Amulets, Inscriptions, and Other Sources).” In chapter 3, he describes his method of textual analysis, and I note with gratitude that he has found my work in this area useful (as well as my publications on amulets no. 16 and 24 below). The fourth chapter is the core of the dissertation, where he analyzes 24 amulets on papyri or parchment from Egypt (dating from 3d-8th centuries). He excluded amulets on ostraca or wooden tablets, and those consisting only of Gospel titles or incipits, since this latter category has been treated extensively by Joseph E. Sanzo, Scriptural Incipits on Amulets from Late Antique Egypt: Text, Typology, and Theory (STAC 84; Tübingen: Mohr Siebeck, 2014). In the fifth and final chapter Jones draws conclusions and sums up the results. In relation to the textual character of the 24 amulets, described according to Alands’ categories, he concludes that 37% exhibit a “strict text;” 8% “at least normal;” 12% “normal;” 29% “free;” and, finally, 16% “uncertain.” This result suggests that, although three of them are areadly included in the official list of New Testament manuscripts (P78, P105, and 0262) and cited in the apparatus, many more are significant for New Testament textual criticism. Open access to the dissertation from Concordia University Spectrum Research Repository here. If you want to hear Brice’s own words about this academic journey you can listen to two interview episodes by Inquisitive minds podcast here and here. At present, Brice is Assistant Director of Media Relations, at the University of Louisiana at Monroe. We can all hope that he will continue to do research in the future. His track record is indeed excellent, as reflected in the fact that he got fifteen articles, including many editions of papyri, published already as a PhD student. 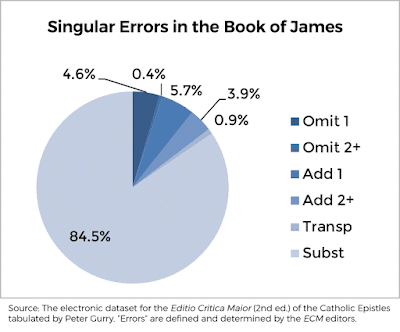 I recently finished working through all the singular readings in James according to the Editio Critica Maior (ECM). There are 1,245 of them according to my data. 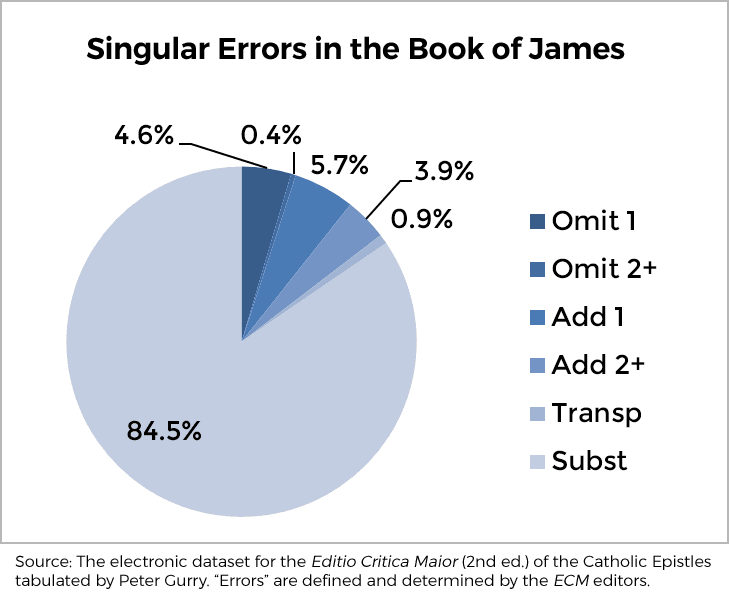 I picked James because it has the most manuscripts of all the books in the ECM of the Catholic Epistles. One result from my data is the various types of changes that occur among the singular errors. Here “error” (Fehler) is any reading that didn’t make either logical or grammatical sense to the editors (p. 27*) and “singular” is defined relative to the Greek manuscripts in the ECM. There are 493 such singular errors (39.6% of all singulars). As you can see, the vast majority are substitutions (84.5%). Unexpectedly, additions outnumber omissions almost 2:1 (9.6% vs. 5.0%). This is not true of singular readings as a whole in James where, as in Royse’s study, omissions outnumber additions. You could make an argument that singular errors provide us with greater “moral certainty” (to use Hort’s phrase) about their being scribally created than non-error singulars since nonsense is less likely to be copied than sense. But I find that there is a certain trade off in studying scribal change between the guarantee of purity in the data (“moral certainty”) and the volume of the data. At some point, more data that’s less pure is actually better (i.e., more representative) than less data that’s more pure. But more on that another time. To give a flavor of some of these errors, here are the first two verses of James. An interesting study would be to consider the non-singular errors alongside the singular errors to see if there are any patterns that might help explain why some were made more than once (assuming they are non-genetic). If anyone is interested, you can download the spreadsheet with all 493 singular errors. The journal TC: A Journal of Biblical Textual Criticism was founded by James Adair in 1996 as one of the first electronic journals devoted to Biblical Studies. In 2010 the journal was relaunched after some time of inactivity, when Jan Krans, Tim Finney, Thomas Kraus, Heike Hötzinger and I formed a new editorial board. Subsequently, Juha Pakkala joined the board. Since then, we have been able to publish six complete volumes, and, the latest one, vol. 20, marks the 20-year anniversary of the journal (and the 5-year anniversary of its relaunch). Volume 20 is packed with articles and reviews (see contents below). Several new articles from a panel on the Coherence-Based Genealogical Method (CBGM) were published just before New Year. The editors would like to welcome new submissions from readers of this blog! 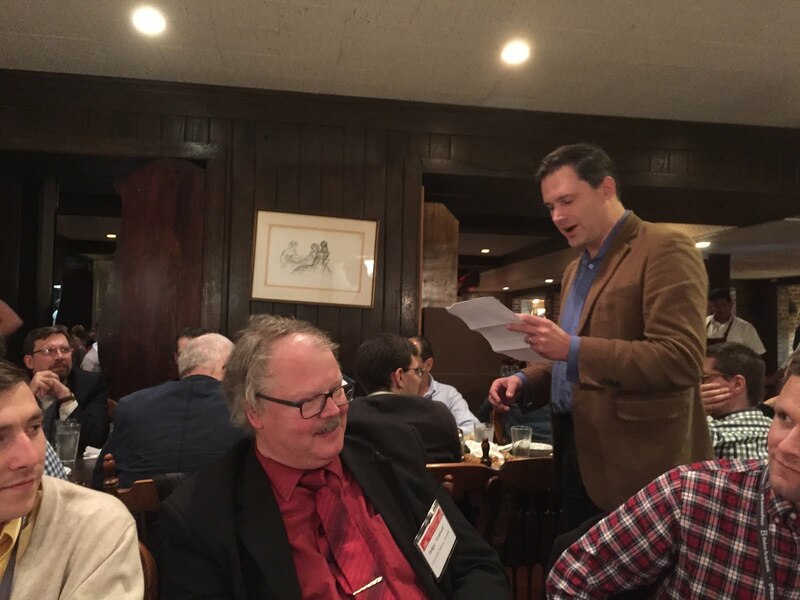 The following introduction and four articles are based on papers delivered in the panel session “The Genealogical Method” of the New Testament Textual Criticism section of at the Annual Meeting of the Society of Biblical Literature, San Diego, 22 November 2014. Abstract: An introduction to the articles in the special feature including a short summary of Dirk Jongkind's contribution to the original panel discussion, which is not included here. Abstract: The categorical distinction between manuscripts as artifacts and the texts they carry is a cornerstone in the theoretical framework of the Coherence­Based Genealogical Method (CBGM). As a consequence a textflow diagram shows a structure that integrates states of text and must not be confused with an outline of actual historical procedures or a stemma of manuscripts. The structure reflects the degrees of agreement between texts (pre­genealogical coherence) and philological assessment of the relationship between the variants found in them (genealogical coherence). Abstracting from the relationship between actual manuscripts has been criticized as unhistorical. However, the ability of the CBGM to cope with contamination hinges on this abstraction. Abstract: The reconstruction of the initial text by means of the Coherence-Based Genealogical Method is carried out on the basis of assessments of the genealogy of variants at each variant passage. The resulting relationships between variants of the same passage are graphically represented by so-called local stemmata. The construction of these is done in phases proceeding from secure cases which hardly need any discussion to those whose analysis requires genealogical data. Abstract: A series of examples relating to the guidelines set out in The CBGM Applied to Variants from Acts: Methodological Background. These examples are also referenced in Annette Hüffmeier's The CBGM Applied to Variants from Acts. Abstract: This contribution illustrates use of the Coherence-Based Genealogical Method (CBGM) to develop and weigh external evidence in a new way. The CBGM tries to control the subjective element of applying external criteria (e.g. “best quality witnesses”) by taking into account how all included witnesses relate to one another in terms of coherence. Each variant is assessed impartially regardless of its appearance in a certain group of manuscripts or its apparent importance. As a rule, this approach assumes a scribe did his best to produce a fair copy of an exemplar. He did not distinguish between more or less interesting variants, and often we can only speculate about the reason why a variant arose. Illustrative examples from editorial work with Acts reveal important insights that are generated when the results of coherence analyses are balanced with everything else known about the textual transmission of the New Testament, especially on the basis of the internal criteria of Transcriptional Probability. Abstract: This article demonstrates how the traditionally accepted philological principles of textual criticism and the editors’ view of the textual history of the NT exert considerable control in the application of the Coherence-Based Genealogical Method (CBGM). The article focuses on the textual variation in Mark 1:1 (involving the words υἱοῦ θεοῦ, “Son of God”) as a test case in order to probe the initial stages of the method, that is, the evaluation of so-called pre-genealogical coherence, followed by preliminary genealogical assessments (based on the particular editors’ view of the textual history), and the construction of local stemmata. The method allows variants to be both counted and weighed in terms of their genealogical significance, depending on the overall textual relationship between the witnesses that attest them, as well as their philological nature. In regard to Mark 1:1, it is easy to explain by palaeographical consideration how the nomen sacrum (ΥΥ ΘΥ) could have been omitted, but some scholars have expressed doubt that this would happen in a book's opening lines. The present evaluation of pre-genealogical coherence shows that the shorter reading without υἱοῦ θεοῦ (“Son of God”) has imperfect coherence—the variant is attested by a number of unrelated witnesses, and the variant has clearly emerged several times in the history of transmission, probably by accident (and several witnesses have been corrected). This evaluation and a preliminary genealogical assessment supports the longer reading in Mark 1:1. Abstract: Despite the term “genealogical” in the name Coherence-Based Genealogical Method, researchers should not expect the CBGM to provide a proposed history of the text through its manuscripts. This puts a premium on the use of internal evidence to establish the initial text. Welcome to a new year with the ETC blog and lots of textual criticism! At the SBL meeting in Atlanta, we celebrated the 10-year anniversary of the blog at the annual ETC blogdinner, and the founding father Peter Williams held a speech looking back at the ten years and ahead into the future. Incidentally, we celebrated the 5-year anniversary at the SBL meeting 2010, held in Atlanta too. 1. The blog started out on 14 Oct 2005 when Peter Williams wrote the first blogpost: “What this blog is about”. In his Atlanta speeach, Peter told us that he had not planned to found the blog, it was a spur of the moment thing which he did because he was angry – particularly at Bart Ehrman's views on the NT text (Pete's subsequent review of Ehrman's Misquoting Jesus is our most popular blogpost ever). d) I could probably read it without squinting." 2. The ETC blog had a very different lay-out in the beginning, first briefly with a black background, but then for a few years with old burgundy and white letters (a combination which caused problems to some readers). You can see what it looked like here (by this time in Nov 2005 I had joined the blog and we were eleven contributors). 3. In the end of 2006, blogmeister Williams was appointed the new warden of Tyndale House, and from about that time he handed over the main responsibility for the blog to Peter Head and myself. 4. In 2009 we made some updates to the design and experiments with colors and design. We kept the old burgundy in the header and the letters, but now it was more reader friendly, see here. 5. In October 2014, Peter Gurry, PhD student in Cambridge, joined the blog and helped us give it the current nice new look.